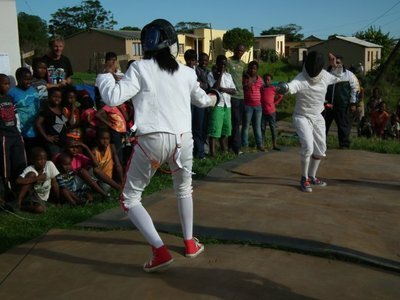 Chuma Nyendwana and Zolani Fandezo were invited to a fencing course in Cape Town, to get them basic fencing knowledge to be able to start coaching our new fencing club as soon as we have equipment. It was a good course that gave a lot of practical ideas how to train and coach fencing. We would like to thank the Western Cape Fencing Association for hosting our coaches for free and the Department of Sport and Recreation for flying them to Cape Town! The club was launched with a fencing show, a fencing challenge (lots of fun to try it yourself) and the official launch meeting where the constitution was accepted and signed. Randall Daniels, vice-president of the South African Amateur Fencing Association (SAAFA), and his team from Christal House School in Cape Town visited us for the event. 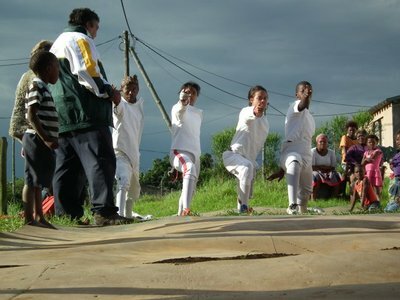 They assisted us with fencing knowledge and they did the show for us.